Campaigners fighting to save a school's head teacher have said they are "shocked but delighted" after his redundancy was put on hold. Swinford Primary School's head Edy O'Connor was set to lose his post as part of a restructure by the Diocese of Leicester Academies Trust (DLAT). Protests from parents and staff led to the trust's board resigning and now the restructure is being reviewed. However, the trust warned "significant financial challenges" remained. Mr O'Connor was handed his redundancy notice earlier this month after DLAT, which runs 14 schools across Leicestershire, proposed appointing an "executive head" to oversee two schools as part of "some very difficult and challenging decisions". 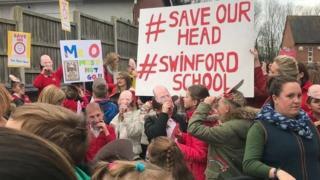 Kat Clarke, chairwoman of the Save Our Head campaign, said: "We were shocked but delighted to get the news. "We have just had nobody listen to us, all the doors were shut in our faces, then suddenly this happens. "Now we will let the new board talk to the school's governing body but still push for changes." Mrs Clarke said the group was still calling for the trust CEO also to go and wanted the school to leave the trust entirely. Stephen Adshead, chair of the new DLAT board, said: "We have made the decision to halt the restructuring process. "We do so acknowledging the fact that our first review of the finances clearly suggests that changes are going to have to be made, and we are not ruling out any options for the future."